Pianist-composer Brittany Anjou blends the influences of a wide range of jazz and classical piano, and a fascination with the Esperanto language, on her stunning debut Enamiĝo Reciprokataj, set for a February 15 release on Origin Records. 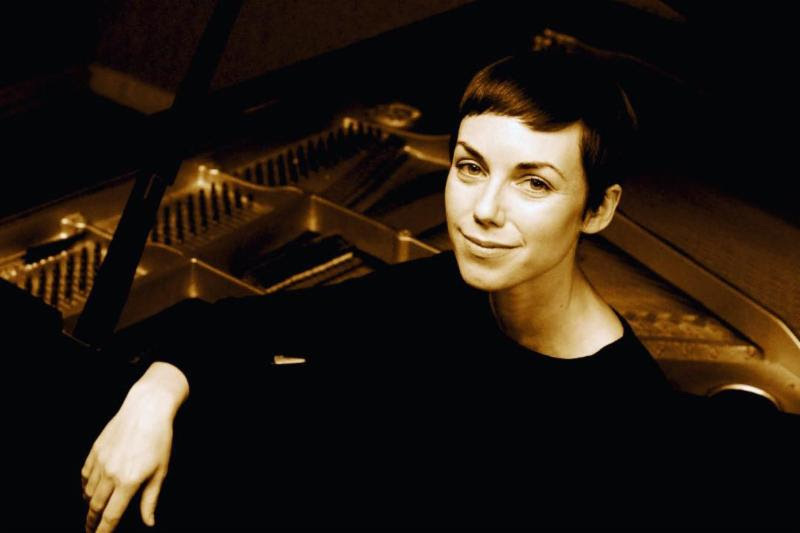 A trio album featuring bassist Greg Chudzik and drummer Nicholas Anderson (as well as two tracks with special guests, bassist Ari Folman-Cohen and drummer Ben Perowsky), it also includes 10 original compositions, highlighted by an eponymous five-part suite that showcases both Anjou's ambition and her originality. Enamiĝo Reciprokataj (pronounced En-ah-mee-joh Reh-sih-pro-kah-tye) translates into English as Reciprocal Love -- or, alternately, as Mutual Breakdown. "[It's] a double entendre about improvisation and the push/pull of relationships," Anjou writes. She also refers to multiple levels of relationships: "It represents the enigma improvisers face to spontaneously fall in love with their instrument/the sound/the situation/each other," she says. "And additionally, to convince an audience to fall in love with their love." If the concept sounds somewhat esoteric, the music itself is anything but. The album's bookend tracks, "Starlight" and its reprise "Reciproka Elektra," alternate instantly compelling, electronically processed washes with warm and confidently swinging piano-trio melodies. Each of the suite's five parts comprises an expressive, hook-filled tune and improvisation set to a joyful dance of a rhythm, from the whirlwind "Reciprokataj I: Cyrene (Flight of the Butterfly)" to the 5/4 bounce of "Reciprokataj IV: Olive You." Even the grim determination Anjou presents on "Reciprokataj V: Flowery Distress" is offset by Folman-Cohen and Perowsky's irrepressibility. The album also honors Anjou's most important pianistic influences. Her phrasing and chord voicings channel the respective spirits of Oscar Peterson and Red Garland; in addition, she separates the parts of the suite with songs that directly pay tribute to favorites Ahmad Jamal ("Snuffaluffagas") and McCoy Tyner ("Hard Boiled Soup"). "All of the music celebrates my love affair with great jazz pianists," she says. Anjou's use of Esperanto is not incidental: With Enamiĝo Reciprokataj, she begins a planned trilogy of albums based on the concepts and structures of world languages. (The next two installments will center on Dagara and Arabic, respectively.) "To me, Esperanto is a romance," she says. "The language mirrors jazz improvisation . . . . Jazz and Esperanto are both contemporary languages of the last century, and both promote intercultural dialogue, democracy, and self-expression." As a high school student, she joined and toured with Seattle's Roosevelt High School Jazz Band, meeting and performing with Wynton Marsalis in New York. Attending the Stanford Jazz Workshop at 16, she worked with Clark Terry, who became her idol. It was around that same time that Anjou began composing -- including much of the material that eventually became Enamiĝo Reciprokataj. Anjou began performing selections from Enamiĝo Reciprokataj while living in Prague in 2005 and continued honing it thereafter, including in a well-received performance with Bi TYRANT at New York's Zinc Bar during the 2018 Winter Jazz Festival. In the fall of 2018, she returned to Kuwait to teach piano and jazz ensembles as part of a nine-month residency at the Sheikh Jaber Al-Ahmad Cultural Center opera house, in an experimental music program, the first of its kind in the country.